I'm taking a step back in time - Some might call it Throw Back Thursday, either way I'm re-sharing/recycling an old blog post that seems to go well with the other multi-media posts I've shared this week. I've just recently started to use YouTube in the classroom. I am hooked on Mr. Harry's Kindergarten. Maybe I'm coming late to the party, but it's really not my fault. Our district had blocked You Tube and other video streaming websites. Now, it is intermittently blocked. Somedays it works and others I get this large flashing red stop sign that makes me feel like I was trying to access some type of adult risqué web site. I new there had to be a way for me to save those great teaching You Tube videos to my laptop and play them at school. And the answer is YES, There is. It lets you download the video and save it to your personal computer. However, I took it one step further. I do most of my work from my desktop, so that is where I saved the videos, then I uploaded them to my google drive. Now, now matter where I go, I can access my movie folder. 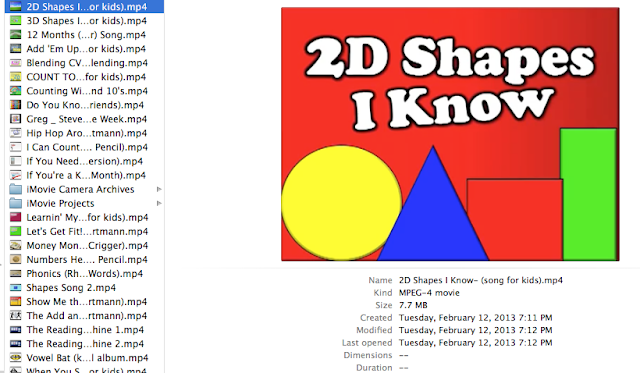 My Kids love the 2D Shapes I Know and the 3D Shapes I Know songs. Their newest favorite is Let's Get Fit. It is a Jack Hartman song made into a video by Mr. Harry. It is perfect for getting them up and moving and they are counting at the same time. Please share with me some of your favorite YouTube videos to use in class.